Pre-register NOW if you haven't done so already. This will save you time Saturday morning as well as help us avoid a bottleneck during registration. Please note the NEW LOCATION! Due to forces out of our control, we had to change the venue to Kenwood Academy H.S. at 5015 S. Blackstone. Take a look at the workshops so you can plan accordingly. BRING YOUR OWN WATER BOTTLE. We will not be providing plastic bottles of water. Here is the schedule for the day as well as the keynote speakers and program. Cuban Street Rumba—Yoruba Opening Salutation "Elegwa"
Kuumba Lynx, “Arizona Poli Tricks." The workshops for this year's TSJ Curriculum have been announced! Please share widely! 1] Organizing Session Against School Closings and for the Elected Representative School Board [this will be repeated in Session 2] [TSJ and members of CTU, CTU Community Board, and Communities Organized for Democracy in Education (CODE)]. This organizing session will focus on educating and organizing against the school closings (for the moratorium) and for the elected, representative school board. We will have a brief panel discussion by activists working on these issues, then break into groups to plan how people can participate and also bring others into the struggle. 2] Adultism House Students from Jordan Community School [Project JAM After School Program/Howard Area Community Center] Adultism House - A project geered towards Educators and Community Members working with Youth. The goal of the project is to teach adults how to be good allies to youth. The Adultism House allows the adults to put themselves in the position of the youth, hear how adults talk down to youth and then assess and empathize. We wish to show adults the power of their words and how they use their position of power to affect the youth. 3] Beyond Tolerance: Integrating LGBTQ Content into Our Curriculum Melissa Tempel, Rachel Harper [Rethinking Schools] As social justice educators, we work to create supportive environments for all students, including those with LGBTQ family, who identify as LGBTQ, are questioning, and/or are gay-baited. We want to go further to integrate studying sexism, gender, and sexuality into the curriculum. The workshop will emphasize collaborating on curriculum that can be implemented during the school year. We hope that some participants will subsequently write about teaching LGBTQ curriculum for publication. 4] Boal’s Newspaper Theatre across the Curriculum Teresa Rende, Elizabeth Rice [Goodman Theater] Augusto Boal’s newspaper theatre form transforms daily news items, or any other non-dramatic material, into theatrical performance. In our Boal’s Newspaper Theatre Across the Curriculum we will introduce the 10 different methods of newspaper theatre, present an original crossed reading to participants (focused on the CTU strike), and offer practical classroom applications of Boal’s newpaper theatre form. Because this form focuses on non-dramatic text, practical classroom applications will include both humanities and STEM applications. 5] Building Grassroots Curriculum Movements Together: CGCT Releases & Workshops Urban Renewal or Urban Removal and the Grassroots Curriculum Toolkit David Stovall, Isaura Pulido, Lindsay Smith, Anton Miglietta [Chicago Grassroots Curriculum TaskForce] We'll release and workshop our two new publications (URUR? and Grassroots Curriculum Toolkit) by breaking into groups based on participant interest/grade levels after an initial interactive and creative introduction to both. Participants will become familiar with both publications, engage their content, offer initial feedback/critiques, and leave with practical guides for classroom or community implementation. Free giveaways, engaging facilitators, and avenues for involvement in CGCT are provided - including all new Parent and Student opportunities. 6] Education for Liberation: Pedagogy of the Oppressed in a Social Studies Classroom J. Cyriac Mathew [Uplift Community High School] Education in general is designed to reproduce our society. But what if we believe that our society needs to be fundamentally changed? 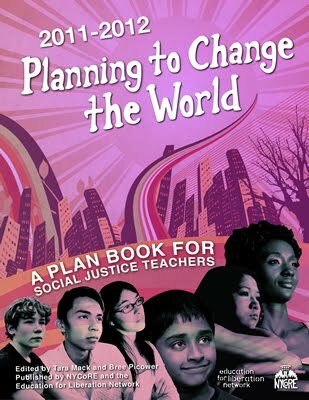 This workshop will present a social studies teacher’s on-going experiment in developing a US History class based on Paulo Freire’s ideas of liberatory education. The presentation is based on a 10th grade US History class, but the ideas will be applicable to social studies classes at any grade level. 7] Reading Rhythm Warriors Amira M. Davis [Educational Consultant] This curriculum is for an 8-week Saturday literacy and arts project for African American males, grades 3 – 6 as a collaboration between an artist-educator and a community organization. Youth engage in reading, discussion and playing African-inspired drum and percussion rhythms. Readings include Africana folktales/fables, biographies, poems, comics, and current events that are directly related to the boys’ lived experiences. The curriculum is thematically constructed and designed to enhance reading fluency, comprehension and personal development. 8] Report-back from the Journey for Justice: Taking the School Closings Fight National [Kenwood Oakland Community Organization] Students and parents with the Kenwood Oakland Community Organization report on the historic Journey for Justice to Washington DC on Sept. 20-21, 2012. Over 1000 students and parents from 13 cities raised their voices for a national moratorium on school closings and for community-driven school improvement. 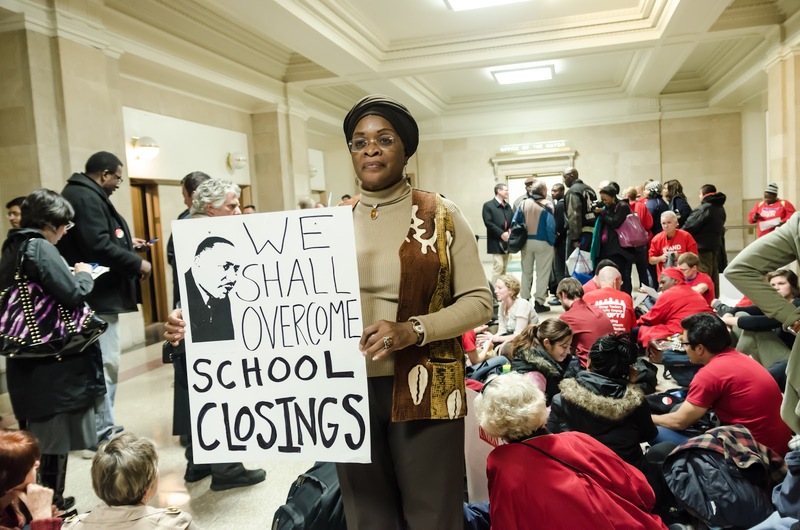 As more cities gear up for a federal hearing on school closings, see how you can be involved in this movement. 9] Organizing Session Against School Closings and for the Elected Representative School Board [this is a repeat workshop] [TSJ and members of CTU, CTU Community Board], and Communities Organized for Democracy in Education (CODE)]. 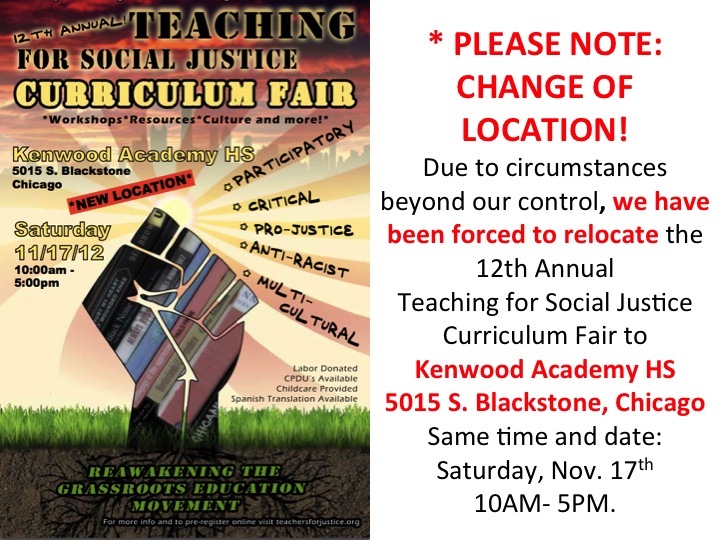 This organizing session will focus on educating and organizing against the school closings (for the moratorium) and for the elected, representative school board. We will have a brief panel discussion by activists working on these issues, then break into groups to plan how people can participate and also bring others into the struggle. 10] Cross-Pollinating the Grassroots Tyler, Kate, and Steve [Beehive Design Collective] We will demonstrate some of the diverse applications of our story-telling graphics by walking participants through a few hands-on workshops emphasizing collaboration, exploration, and the power of art as an educational tool. At this year’s curriculum fair, we are excited to show our work-in-progress "Mesoamerica Resiste!" 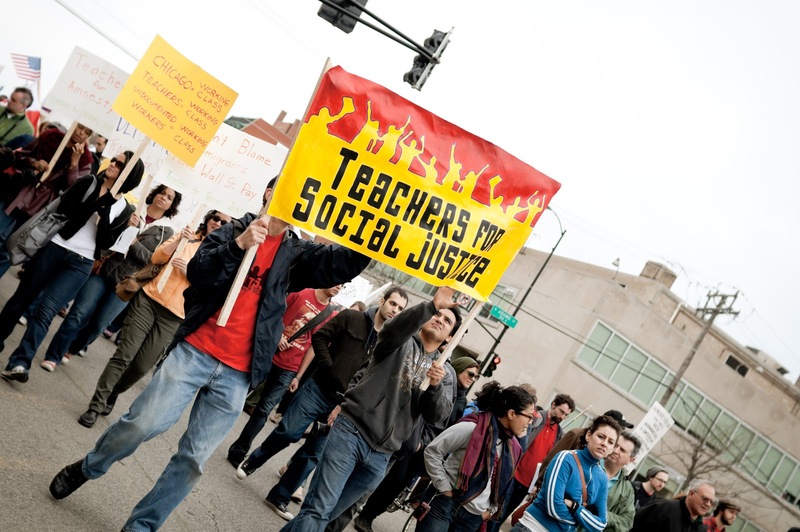 11] Improving Community Relations at Your School Gabriel A. Cortez [Northeastern Illinois University] This workshop will provide information on how schools can create a positive culture and improve relationships among students, teachers, parents, and community members. A checklist of community relations items will be shared and explained with the goal of identifying key resources located inside the school and the surrounding area of the school. This includes identifying particular groups that represent all stakeholders and initiating a channel of a 2-way communication with them. 12] Making Justice Drum David Stoker [Illinois Artist in Residence] Two sessions of 35 minutes, back to back. Participants will learn how to make a simple, amazing drum. Can be a classroom or picket line project. Quick, cheap, anyone can do it. We will decorate the drum with colors and a slogan for justice. Free drum materials included, for 25 people per session. Starts promptly. Adult/child participants welcome. 13] More Sh!t Chief Keef Don't Like—Workshopping Youth, Violence, and the Legacy of Racism in Chicago Kevin Coval, Mariah Neuroth [Young Chicago Authors] Chief Keef rhymes the experiences of so many Chicago youth. Facilitators Mariah Neuroth and Kevin Coval, author of More Sh!t Chief Keef Don’t Like, will provide curriculum and context to address the controversy surrounding the young rapper in classrooms and youth programs. Mariah Neuroth and Kevin Coval will provide curriculum and activities that engage youth in a critical conversation around the issues spoken about and faced by Chief Keef and so many other young people in Chicago. 14] Theater as a Weapon/Forum Theater on Bullying Je Nepomuceno/Nara Movement Project [Howard Area Community Center] Breaking the 4th wall, participants will watch a scene performed by youth, posing the problem of bullying. Participants will then be asked what they would do in this situation and how could they be an ally to the protagonist. However, instead of saying the solution, participants become Spect-actors and will be asked to be part of the scene. The session will start with a quick theater game. 15] “There could be a girlish boy or a boyish girl. You will never know how things go around”: Challenging Gender Norms with Elementary Students Anne Elsener [Dominican University] In this workshop the presenter will guide you through a unit that can be used to provide students in grades 1 – 6 opportunities to develop and use literacy strategies to identify and question author’s message about gender norms in visuals, poems, and picture books. Participants will engage in reading and questioning of texts using literacy strategies and then have an opportunity to discuss how the entire unit plan can be implemented at different grade levels. 16] Understanding and Addressing Student Homelessness Rene Heybach, Brian Dunlop, Sherri Dabney-Parker, Lakeisha Brandon [Chicago Coalition for the Homeless] This workshop will be a collaboration between an attorney, a homeless parent, a school-based "homeless liaison," and a homeless student. It will include a compelling video and a short but basic presentation on the legal rights of homeless students and the correlative legal obligations of schools. The parent and student will then participate with the audience in a discussion on how these rights may be realized and how student homelessness itself can be challenged.